A very well deisnged site and excellent standard of content aimed mainly as a display of superb models, its only criticism is the predominance of empty sections. One can only hope that they befilled quickly. However the quality and character of the conversions dsiplayed there will be provide much incentive and inspiration to newcomers and old hands alike. One of the newer and more promising Dark Angel web sites. Easy navagation is supported by a well laid out and designed site structure. All navagation is from a menu bar at the top. This along with rapid loading times makes it a pleasure to peruse. Content includes a large swathe of mini tacticas and tactical articles along with some sample army lists. A few interesting home made rules can be found in the tech reports section which one would expect to grow with time. 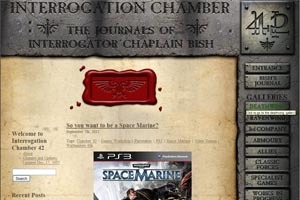 The librarium section contains a huge collection of printable banners along with a list of spacemarine names and a set of very helpful links. The banners are ready for download and printing straight away or you can manipulate them in your imageing programs. Finally the oratorium contains the first two of many armies to be displayed on this site. This site is the main host of the online unforgiven web campaign "Purge of Carthusia". All in all an excellent and necessary site supporting the unforgiven chapers. An unusual Dark Angel successor chapter and its home site as stated in the first page. A nice selection of colours and iconography greets the visitor on arrival along with an explanation about their creation, namely as a discussion and greeting ritual at the Bolter & Chainsword forum. The history and background along with the web site is the accomplishment of a number of individuals who have dedicated themselves to this successor chapter. Separate sections are dedicated to the background history, chapter organization, characters and their individual background stories. All characters are based on each of the individual responsible for the creation of the chapter and the site. There are sections for sample army lists, special rules for special characters, painting guides and galleries all related to the green and yellow marines of the chapter. They have their own discussion forum which given its nature is not very busy but is intended to support the webmasters development of the chapter. All in all an excellent effort at team work and a classic example of how to develop a successor chapter. An unusual web site that is entirely dedicated to a single but massive online campaign conducted by the web master. The campaign itself was based on events taking place in the Amicus Cluster. The online campaign was conducted by a loose system and was based on the dark Angel forum of the famed Bolter & Chainsword Spacemarine Forum. 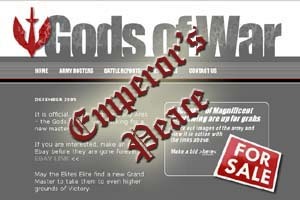 Members taking part simply sent in their battle reports and the results were amalgamated in to the continueing storyline. The narrative campaign story remains to be edited and published. As a stand alone web site, this particular site does not provide many sections or variety. 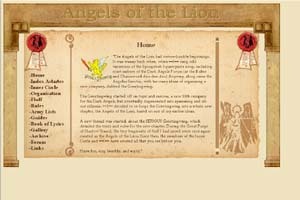 But take it in the context of its creation, and the list of more than forty battle reports, many of them with images supplied, and then it simply becomes a superb resource site for Dark Angel players. In addition a single link from the site would take you back to the superb display of the webmaster's own Dark Angel armies. A brilliant web site created by master modeller and artist GM ZeussS, this was the first web site dedicated to the first company of the Dark Angel chapter, the Deathwing. Very welldesigned with a slick interface and light colours the site is immediately appealing, with a short news window denoting the latest addition to the site. 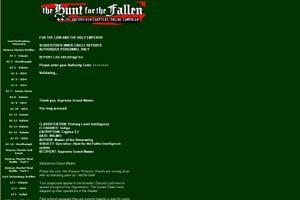 The site contains Army Rosters, Battle Reports, Resources and Contacts as its main sections all of which can be accessed from a menu bar at the top. The Army Roster section contains the webmaster's Deathwing army roster while the Resources section details modelling and painting techniques by the webmaster and some great Deathwing tactica articles by other Deathwing masters. It is in the Battle reports section that this site completely outdoes itself. A number of superb battle reports that would put the white dwarf batreps to shame are presented, complete with background, army lists and turn by turn description all supported by a dizzy array of battle scene images. 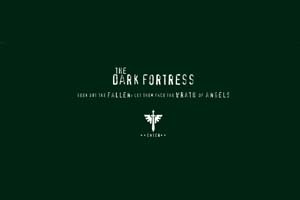 A superb addition to the Dark Angels presence on the web and a must visit site for every Deathwing commander.